A Neolithic burial cairn just west of Loch Watenan, composed of two chambers, accessed via a horned entrance forecourt. 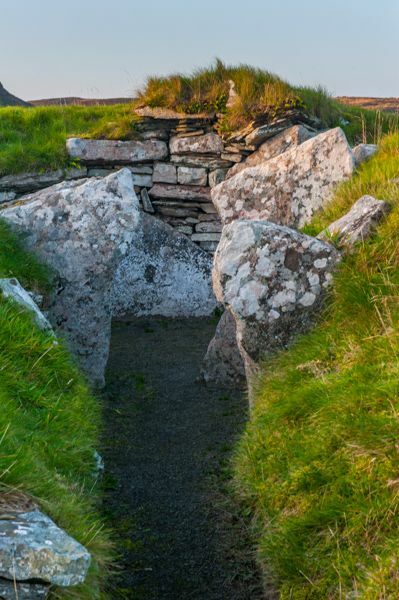 The exposed inner passage makes for easy access to the cairn interior, and you can easily see how the passage was built, and how large upright stones were used to create three small compartments. 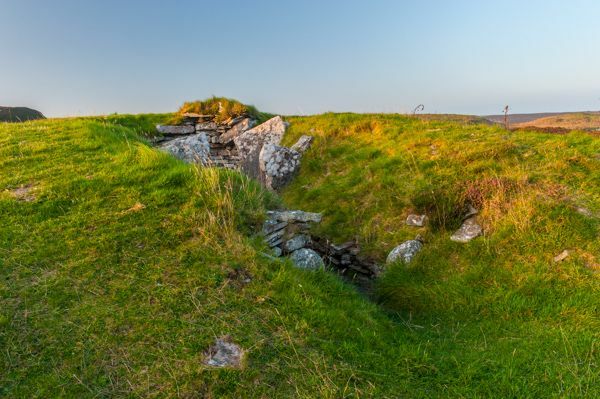 When the cairn was excavated in 1866 the bones of at least 7 people were found in the passage, with remains of ash, burnt and unburnt bones, pottery, and flint arrowheads in the main chamber. The cairn stands in a landscape of numerous prehistoric remains; within a short walk are several stone rows, a pair of Iron Age brochs, further chambered cairns and cist burials, hut circles, and the remains of a hill fort. Access can be wet - wear good waterproof footwear! Cairn o' Get is well signposted off the A99 near Ulbster (though the last time I drove past, the sign heading south had fallen and been propped up again). You follow a narrow road with passing places for about 400 yards. You pass a sign for the trail to the cairn on your left before reaching a small parking area on your right, immediately beside the loch. The trail leads across several fields and crosses some boggy ground where a boardwalk has been laid down, before climbing a small hill to the cairn. There is an information board by the side of the path. 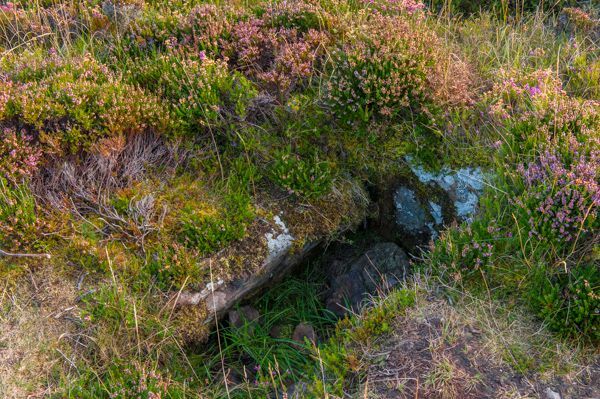 The top of the cairn has been lost over time, so you don't have to crawl on your hands and knees like you do at the nearby Grey Cairns of Camster; you can walk right up the entrance passage to the central chamber. It is very easy to see how the shape of the inner chamber slopes outward, then inward as it gets higher. This drystone corbelling is one of the best features at Camster, and here at Cairn o' Get you can more easily see how the dry stones were overlapped to create a rounded chamber roof. One thing the sign doesn't show is that just before the cairn you pass a small stone-lined cist on your left. 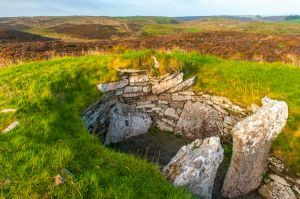 I've been to Cairn o' Get a couple of times, and I find it a very moving place; the views across the surrounding countryside are excellent, and you can easily make some of the other ancient sites in the area, and other bumps in the landscape that probably represent unexcavated sites! The famous Hill O' Many Stanes site is about 3 miles away. 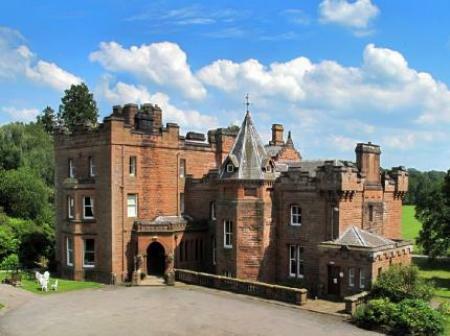 Location: 1.5 miles South West of Ulbster, to the west of the A9. Signposted trail from car park, a walk of 3/4 mile - follow the black and white poles. 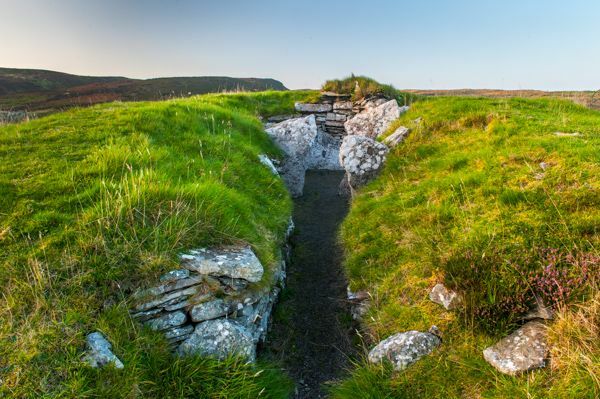 Nearby accommodation is calculated 'as the crow flies' from Cairn o' Get. 'Nearest' may involve a long drive up and down glens or, if you are near the coast, may include a ferry ride! Please check the property map to make sure the location is right for you.